There has been the occasional bit of news about Scott Derrickson's plans to make a film version of Milton's Paradise Lost, though things seem to be progressing rather slowly. But not as slowly as they might be. The Hollywood Reporter is carrying a story that producer Martin Poll has been trying to make a movie based on the 17th Century epic poem since the late sixties. Encouragingly, for Poll at least, it seems he's finally got someone to bite. Granite Entertainment and STV Networks have decided to team up with Poll, despite the potential competition from Derrickson's picture. And what with the release of Year One this June, there could be 3 films about Adam and Eve in theatres in the next year or so. I always find it funny how these coincidences seem to happen. 2006 saw two films released within weeks of each other about Victorian magicians. As Jeffrey Overstreet points out there were also two films about Truman Capote around the same time. I wonder if anyone will play these on a double bill when the time comes. Young theater director Irena (Kasia Smutniak) comes to a Turin prison with the blessing of inhouse priest Father Iridio (Gianluca Gobbi) to develop a performance piece with the convicts. Mistakenly believing she'll be allowed independence, she has to fight the disapproval of jail head Libero (Fabio Troiano) and then Father Iridio himself when the actor-wannabe priest forces her to tackle Jesus' Passion as her subject. 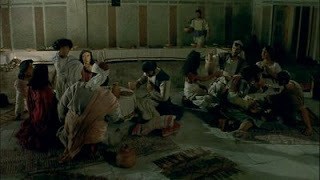 Irena hits a brick wall when none of the prisoners will play Judas. So she develops another idea: present the Jesus story but without a traitor, and without the sacrifice. Now Father Iridio and straightlaced nun Sister Bonaria (a delicious guest role for comedienne Luciana Littizzetto) try to block the performance, though Irena's new intimate relationship with Libero means she has a powerful ally. The film's official website has a trailer, photo gallery, cast and credits and various other features, and the film's soundtrack is already available to buy. There's no news of if, and when this might be released outside of Italy (where it was released on the 10th April). Thanks to Peter for the tip off. I'm pleased to announce that I will be speaking at this year's Greenbelt Festival. Greenbelt has a unique place in my heart: an annual pilgrimage that has nurtured, shaped and challenged my faith, year in year out. I first went to Greenbelt 20 years ago (as a 14 year old) and this, I think, will be my 15th festival in all. Given that this is also the first time for me as a speaker at the festival, it's fair to say I'm looking forward to it! I'll be speaking on "Biblical Horror Stories for Children": looking at the parts of the Bible where God has people killed, wondering why the place we're most likely to hear these stories is Sunday school, and asking how we should respond. 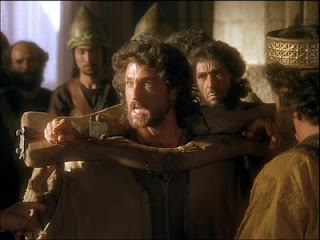 I'm hoping to use a clip or two from Bible films, as there are some really good examples of how we selectively read the text to suit our sensibilities. I'm also hoping that I'm not on at the same time as this year's main speaking attraction - Rob Bell. There's a 15% discount for anyone who books in by the end of April. 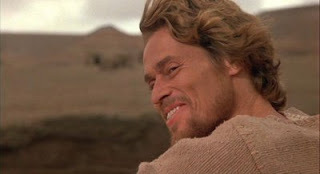 Anyone who is interested in Bible films, lives in the US and wants to see, but doesn't want to buy, Last Temptation of Christ, will be pleased to know that you can now see it for free at hulu.com. That excludes me on at least two counts, but in any case, I'd urge anyone who wants to see it to catch the Criterion Collection DVD instead. But thanks to Jeffrey Overstreet for the tip off. After disappointing reviews, and bad viewing figures. NBC's Kings has been taken off air until the summer (Hollywood Reporter). The first sign that the sci-fi series was under pressure was when it got switched from Sunday night to Saturday. 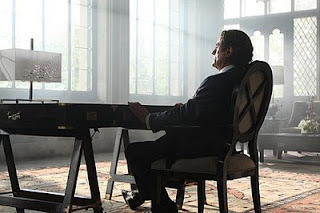 Now it's been taken off air altogether to make way for Law and Order re-runs, with the intention of it resurfacing on June 13th and running until 25th July. 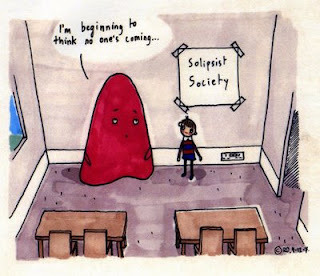 The concept was always going to be a difficult sell, particularly for a whole series rather than simply as a one off. And the strain of trying to make credible, audience-pleasing drama whilst simultaneously trying to allegorise obvious took it's toll. Either that or they really should have sent me a screener. For me, the sad thing about all of this is that now I may never get to see it. If it's been pulled quite so quickly, then there's a good chance it'll never get released on DVD. Thanks to BethR for breaking the bad news. 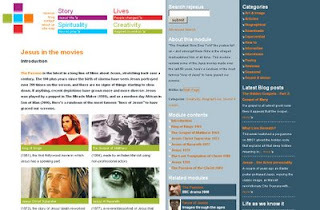 Last year I wrote a module for ReJesus on Jesus in the Movies. The site got updated just before Christmas last year, and my article has been in the queue to get reloaded ever since. I just heard that the piece is now back up again at this new URL. My reviews of Son of Man and The Miracle Maker have also been reloaded. I was a little pushed for time on Friday when I posted a scene guide for Jeremiah, so I postponed writing a few notes on it until today. The first thing to say is that whilst the vast majority of the material is drawn from the book Jeremiah, there are a few places where the film draws on parts of 2 Kings to fill in the historical gaps. It's also interesting to note that most of the material taken from Jeremiah, aside from the opening, is taken from chapters 20-30. There's not a single reference from chapters 40-49 (where Jeremiah is mainly cursing the other nations), and only one from 10-19 (Jer 16:1-4). This passage - where Jeremiah is told not to take a wife - and Jer 34:8-11 - where Mattaniah frees the slaves before reversing the decision some time later - are used to insert the film's only real extra-biblical sub-plot where Jeremiah falls in love. This is actually a fairly common device employed by The Bible Collection's films, and in some of the other cases the picture is severely derailed as a result. Here the filmmakers manage to keep it under control so it forms interesting speculation that highlights Jeremiah's sad and introspective character. Working out this scene guide does give me more of a feel for just how jumbled the book's chronology is. Of course some of this is down to the filmmakers rather than the source material, but material from the siege of Jerusalem, for example, is really spread around in such a way as to make me wonder why. Is there a purpose to this ordering, or was this just not considered important or in any way useful? Overall I think the film does a great job of summarising Jeremiah and putting him in his historical context, and it manages to include most of the book's famous passages. 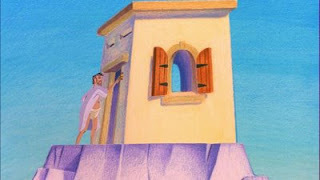 One surprising omission, however, is the story of Jeremiah at the potter's house and the attached sayings (Jer 18:1–23). The film does include the vision of the upturned pot, and perhaps the writers thought that too many pot symbols might be confusing. Even so, I would have thought the potter's house passage would have been the one to be selected. There are a few things I noticed about the call of Jeremiah. 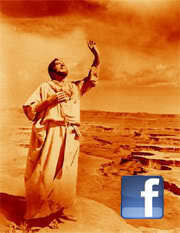 Firstly, the film enhances Jeremiah's call with elements from the call of Isaiah (Is 6). In the book of Jeremiah, there's no mention of a vision, and God touching Jeremiah's lips appears to be more of a metaphor than anything else. We're also not told where this call took place. 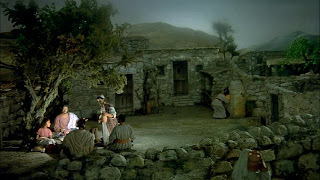 In the film, however, Jeremiah also sees a vision, twice, and on both occasions it occurs in the temple. It's interesting that the second of these quotes part of Jer 5:14 "I have put my words in your mouth", but cuts off before the use of the word "fire". Instead this element is represented visually as part of Jeremiah's call. There is actually a further part of Jeremiah's call - the vision of the almond tree, but I noticed that the interpretation of this vision alters some of the details of this vision. The text simply says that the sign means that God is "watching to see that my word is fulfilled". But the film expands this to say "as this tree is in a hurry to sprout, so God is in a hurry to carry out his work". 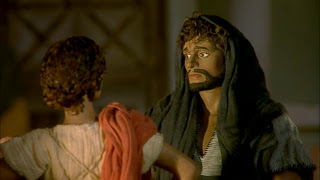 Lastly, I'm going to make a separate post another day to look at the way that the Jeremiah of this film prefigures Jesus, particularly the Jesus from the later film in the same series. 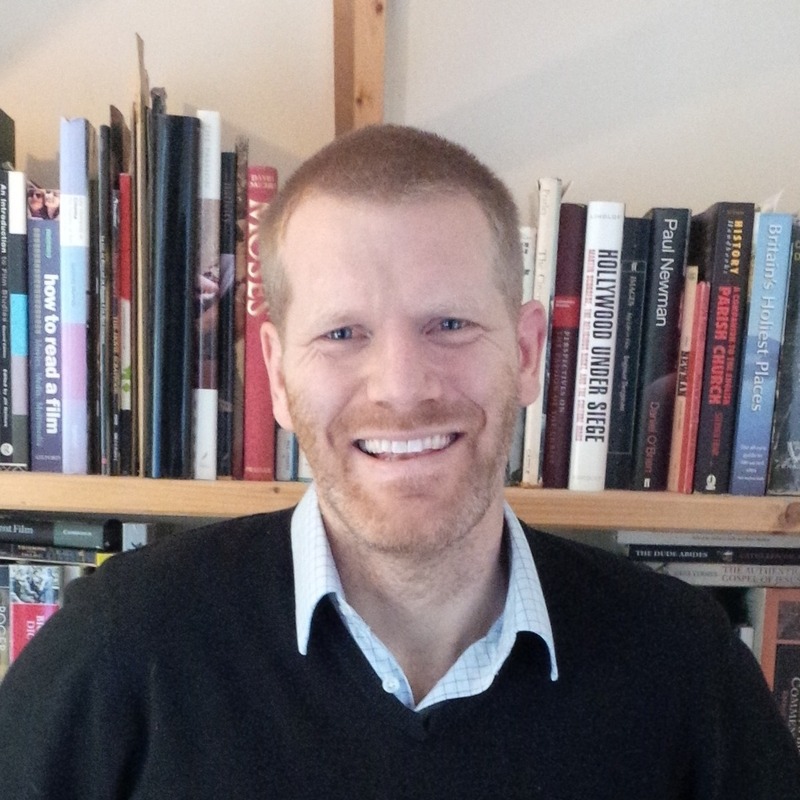 S. Brent Plate has written and edited a number of books on faith and film, including 2004's "Reviewing the Passion" about The Passion of the Christ and his latest "Religion and Film: Cinema and the Re-Creation of the World". 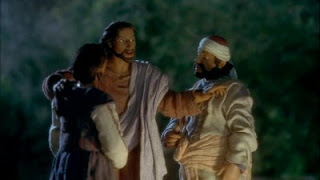 Earlier in the month, Brent wrote an article for Religion Dispatches called Pop-Eye: Global Jesus on Film. 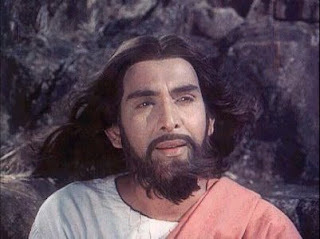 Rather than exploring the multitude of Jesus films as many do at this time of year, he has focussed on those with a more "international" flavour: Dayasagar / Karunamayudu (1978), Son of Man (2006), Hombre mirando al sudeste (1986) and Mesih (2007?). I've not yet had a chance to watch Mesih, Jesus Spirit of God or any other version of that material, and I've had a DVD of Hombre mirando al sudeste for about 2 years which I've not yet found time to watch, so it's interesting to read a bit more about those films. 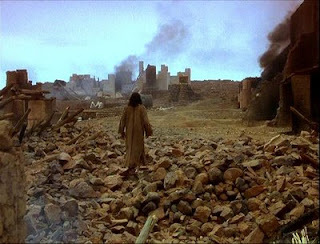 Brent's article is well worth a read and its study of non-Western Jesus films is certainly a welcome addition to the growing number of articles on the subject (see right hand sidebar for a fuller list). I've been working away on a scene guide for the Bible Collection's Jeremiah ever since I re-watched it a couple of months ago. Of all the scene guides that I have done to date, this has certainly been the most difficult to put together. Not only is Jeremiah the Bible's longest book (based on number of words), but it's chronology becomes increasingly unlinear the closer you look. Furthermore, an odd verse can carry a great deal of narrative weight, but trying to find it, even with the wonders of the internet, can be like trying to find a needle in a haystack. 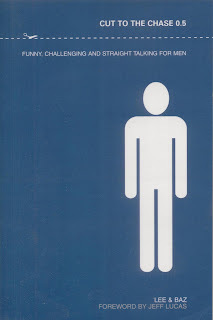 As well as my guide that follows below, I would also like to recommend an excellent outline of this film by Neil MacQueen. MacQueen's outline gives timings and descriptions rather than verses like my own, so the two complement each other quite well. 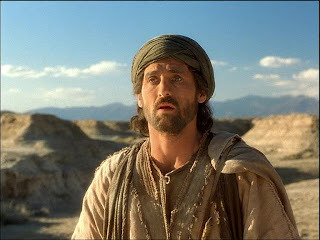 I've chosed to call Jeremiah's primary royal opponent by his original name Mattaniah, rather than the name Zedekiah which was given to him by Nebuchadnezzar as this is what the film calls him throughout. Interestingly scripture mainly calls him Zedekiah. I have a few more points that I'd like to make on this, but I'm pressed for time at the moment so I'll return to this task next week. Edit: This can now be found here. Ancient / Hebrew Bible comedy Year One has had a substantial amount of new material added to its official website including a synopsis, a gallery, an interactive stone-age game, and the trailer and sneak preview videos that have been released previously. There's also the above image to download. Speaking of this film, Peter Chattaway also discusses the news from The Hollywood Reporter that the film has been given a PG-13 rating after making some cuts to the film. It will be interesting to see if similar cuts are made before the movie's release in the UK and Canada. Jesus Flickfest 4 starts today in Winnipeg, and a few more details are available online. 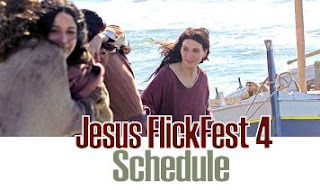 The Jesus Flickfest blog has, rather aptly, been resurrected, and now contains a full schedule. Alternatively you can download a brochure and a poster. There's also links to a handful of trailers. The festival kicks off tonight at 6pm local time with Cotton Patch Gospel, just one of the films on display that I have yet to see. It's be great to hear some reflections on the event from those who are able to attend, so feel free to post them up. Terry Strial's controversial Jesus novel is to be adapted into a film according to various sources. "Plan 1 from the Outer Empire" starts off like a conventional life of Christ, but deviates substantially after Jesus's supposed death. 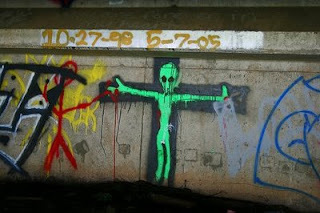 Following the burial scene it's cleverly revealed that Jesus was not in fact fully human and fully God, but simply an alien from another world seeking to solve the problems of the universe's most troubled planet. When even his resurrection fails to bring about the solution G-zu5 and his people were hoping for they decide it's time for him to come home. Anyway, the rights have been snapped up by Pathé although there's no word on who will direct. It's thought Strial will rework the novel into a screenplay, possibly under a subtler title. "The original title gave the game away somewhat" he said "I'm hoping we can sneak this in under the radar so that, for some people, it's only when they see the film they come across the alien thing".